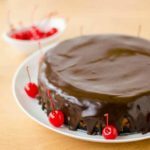 A recipe for chocolate covered cherry cheesecake. A rich and creamy cheesecake with maraschino cherries, chocolate cookie crust, and covered with ganache. In an 8-inch springform pan, press the cookie crumbs evenly on the bottom. Spray the sides above the crust with a non-stick cooking spray. Set pan aside. Dry chopped cherries between paper towels and set aside. In the bowl of a stand mixer fitted with the flat beater, beat cream cheese on medium speed until almost smooth. Scrape down bowl and beater. Gradually add sugar, beating until smooth. Add vanilla and beat to combine. Add eggs, one at a time, until just blended. Pour 1/3 of the batter over the crust. Carefully smooth out over the crust. Sprinkle 1/2 of the cherries over the batter. Repeat layers once and top with remaining 1/3 of the batter. Bake until a toothpick inserted near the center comes out clean, about 1 hour 20 minutes. Run a thin-bladed knife carefully around the edges to release cake from the side of the pan. Cool cake completely in the pan on a rack. Cover and refrigerate for at least 3 hours or overnight. Remove the top (side) of the springform pan. If the cake is not even on the top you can slice it to get it more even and level. Place the cake on a rack over parchment paper. Place the chopped chocolate in a bowl. In a small sauce pan, heat the heavy cream until steaming or barely to a simmer. Pour the heated cream over the chocolate and stir until chocolate is melted and mixture is smooth. Let cool for a few minutes to slightly thicken. Pour and spread chocolate over cheesecake letting some drip down the sides. Return cake the the refrigerator until ganache sets, about 1/2 hour. Garnish with maraschino cherries and/or whipped cream if desired. Serve chilled. Refrigerate leftovers covered or in a sealed container for up to 1 week.